My landlord wants me out of my house - what do I need to do now? How long will it take to get a housing association house? Where can I find facts and figures about housing in Copeland? I own an empty property - what can I do about it? How do I get a housing association house in Copeland? 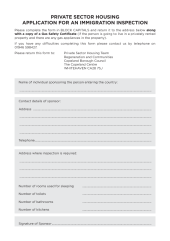 If you wish to apply for an Immigration Inspection, the first step is to complete and return this form.